Experts propose installing drains in each colony and new real estate development in the city. MERIDA – Engineer Ph.d. José Humberto Loría Arcila and Architecture Ph.d. Marco Tulio Peraza Guzmán, both academics and researchers from the Yucatan Autonomous University (UADY), agreed that it is possible to construct a drain net in Mérida. They also admitted that the continuous contamination of the water by filtration of contaminated liquids needs to be controlled because it will bring future problems due to the unstoppable growth of the city and the greater demand for this resource. Ph.d. Loría Arcila recalled that the former governor Dulce María Sauri Riancho asked the Engineering Academy to conduct a study on the feasibility of building drainage in Merida. The proposal was that it could be done using different technologies and areas of the city to avoid any change to the daily life of the population. 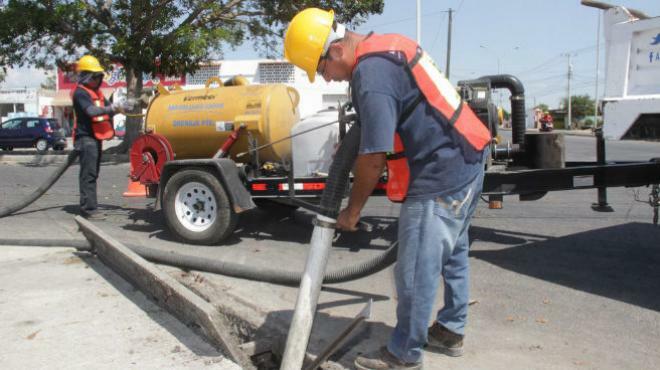 “The construction of drainage net in Mérida is necessary, but it would take 12 to 15 years for its construction and I believe that very few officials would commit to carry out the work,” said Ph.d. Loría Arcila. Ph.d. Peraza Guzmán believes that if the drainage of the colony Miguel Alemán could be done in 1950, now with new and better technology and planning it is also feasible. However, he said that it requires an extraordinary investment, but it is worth it because the city has a serious problem of aquifer contamination and continues to grow. “The most rational thing is that all the new real estate developments have their own drainage,” he recommended. “You could plan the construction of the drainage in a partial way and later try to get it in the consolidated preexistent colonies, mainly where the pollution is generated and filtrated to underground currents,” said Ph.d. Peraza Guzmán. Peraza Guzmán also said that today there are better technologies for the excavation and introduction of pipelines and also, he joked, the Meridanos already suffered the damages of the street resurfacing, so that they would also cope with drainage damage. “It is feasible, but it would be expensive,” he said. “Mérida already needs a gradual strategy for the construction of its drainage in colonies. It can be done slowly and uniting the system with good planning. There will be momentary and minimal damages, but the benefits will be greater as it is to conserve our waters and nature”. He also said that drainage would not be a single administration project because it is a long-term and very costly one, but you have to think of a sustainable city. Unfortunately the example of the colony Miguel Alemán was not followed and Merida grew without its drainage and now it is more difficult to concretize a work of that magnitude. The issue of the drainage of Mérida emerged again in the past days with the suggestion of the Mexican Association of the Construction Industry that this infrastructure is already necessary due to the continuous contamination of the underground waters.